The following is a breakdown of our primary faculty according to the focus of their experiments and missions of their individual labs and collaborative projects. You will find that several members of our faculty are listed multiple times, demonstrating their diverse and interdisciplinary approach to scientific exploration. Click on the headings to learn more about our faculty's work in their fields. The brain is the most complex of all human organs and it has yet to reveal its secrets to scientists. It is composed of over 100 billion neurons, making trillions of connections that remodel every day... (read more). Dynamic remodeling of the cytoskeleton and membranes governs almost every aspect of how cells behave. Because it is so important, they use sophisticated mechanisms to tightly control how and where within the cell they reorganize... (read more). 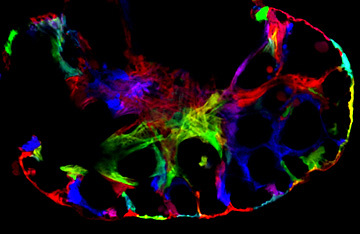 The development of complex organs from a single fertilized cell is a complicated series of genetic, signaling, and cellular events that must be tightly coordinated in time and space. Our faculty are among the best in the world at discovering how these processes are regulated... (read more). Stem cells are unique from all other cells in that they can give rise to any and all of the many different cell types of our body. While it has long been appreciated that embryonic stem cells exist at early stages of development, it has only been appreciated recently that many adult organs also contain small niches of stem cells... (read more). Gifting and support for the important research conducted by faculty in this research area can be directed here. & Tap into natural regeneration programs and boost the innate capacity of tissue to regenerate or rejuvenate.